With no new information on deflated balls from the NFL, it’s time to start focusing on other things heading into Super Bowl XLIX between the New England Patriots and the Seattle Seahawks. 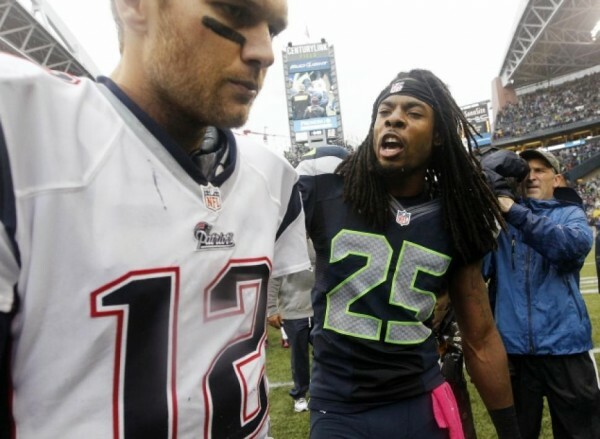 Like what Richard Sherman thinks of Tom Brady, which isn’t exactly a government secret. The Seahawks and the Patriots met in 2012, with the Seahawks coming back from 10-23 down to win 24-23. Sherman walked up to Brady after the game and infamously said “You mad, Bro?” while others like Brandon Browner were a little less gentle with their words. Sherman never forgets anyone or anything he thinks offended him or his teammates, and regardless of the alleged scandal going on right now, he’s quite fired up to face the Patriots and especially Brady again. Why? Because he thinks the Patriots are arrogant. The Seahawks aren’t the only team to use that word when referring to the Brady bunch in the past. You usually hear it from Baltimore Ravens players as well. There’s also the squeaky clean image of Brady which irritates Sherman, knowing Brady to be something completely different. The way he talks to referees or the way he deliberately tried to injure Ed Reed, failing to win and injure him as well at the same time. Sherman didn’t make too much of the deflated balls incident and ongoing investigation. In general, it seems that players and coaches think the media and league are making too big of a deal from this. The fans (some of them) have a different view, seeing this as cheating at a certain level, which is weird especially because there was no need for it to happen in this case. The Patriots reputation in this case isn’t helping.